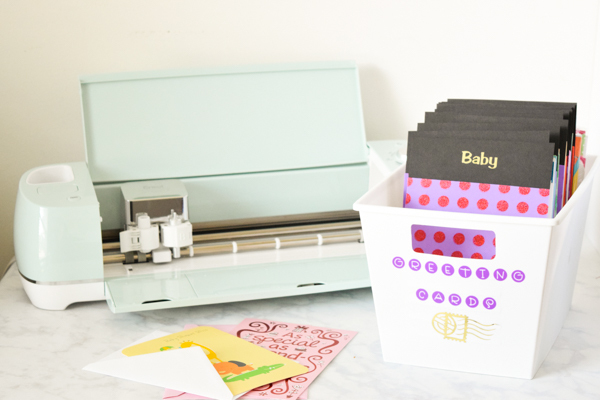 Make your own box of greeting cards with supplies from the Dollar Store and my Cricut Explore Air 2 Machine! 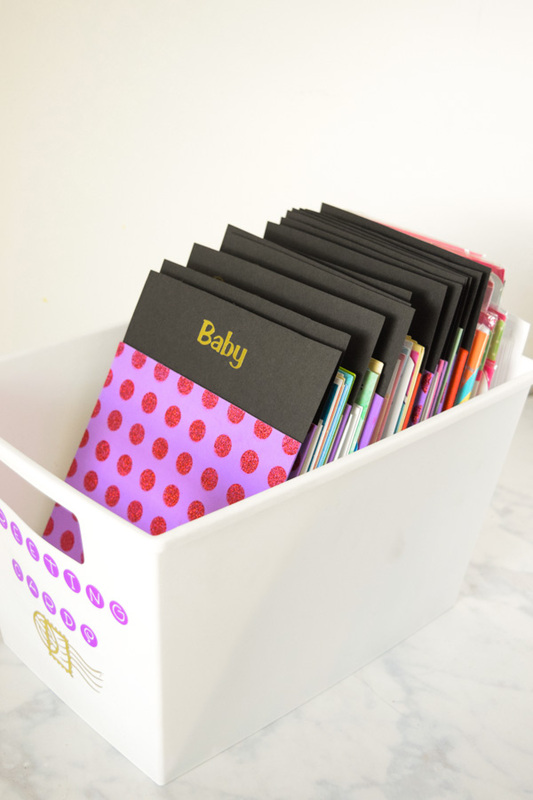 A great way to keep your card file organized and a perfect gift idea for newlyweds! Once upon a time, my husband and I never had a card ready for special occasions. We’d be running out the door to family dinners that typically included a birthday celebration and we’d have nothing. So we would show up at our parents house and hunt down the first piece of paper and pen we could find to create a makeshift card and throw in some money. Or, we’d beg an extra card off of another family member. It was embarrassing! After all, we love our family and friends. We wanted them to know how much they mean to us and that we were thinking about them on their special day. We needed to fix our little problem but how to do it? One day, while at the dollar store, my favorite place, I stopped to look at their greeting card selection. I was pleasantly surprised to find that their cards were equal in quality to cards at other stores but much cheaper! Some were even 2 for $1. 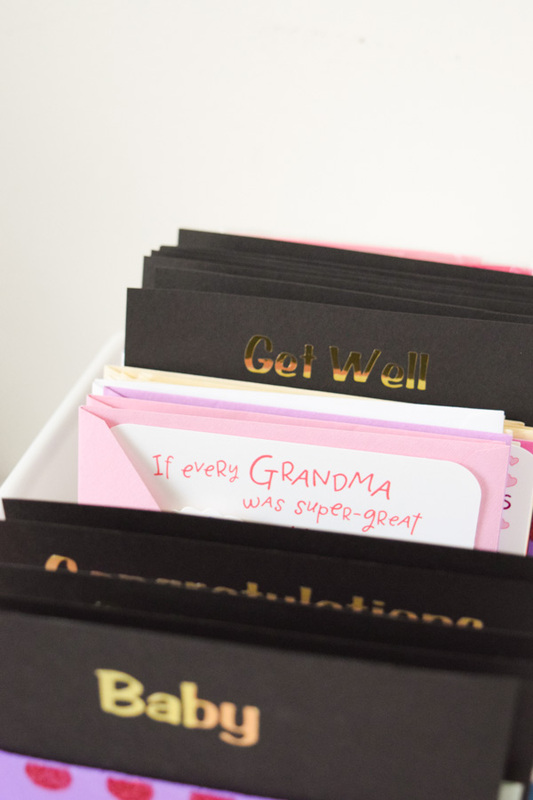 And with a large selection from birthdays to holidays to sympathy, I could stock up on greeting cards and we’d never have to be embarrassed again. The only problem I found after buying the cards was that I really had no good place to put them. I’d misplace them and still scramble to find them at the last minute. Or worse, they’d end up crumpled in a heap. And once again, the dollar store presented the perfect solution to my organizing dilemma. I found a box that was the perfect size to file the cards in their organizing section. I also snagged foam sheets in the craft section to make into filing inserts. In addition to these supplies, I decided to use my Cricut machine to cut out vinyl so I could label everything and make it cute! Because everything is better if it has a little decoration, right? To create the foam inserts, I needed to figure out how tall they needed to be in order to be seen above my tallest cards. I also had to figure out how many of them I would need. 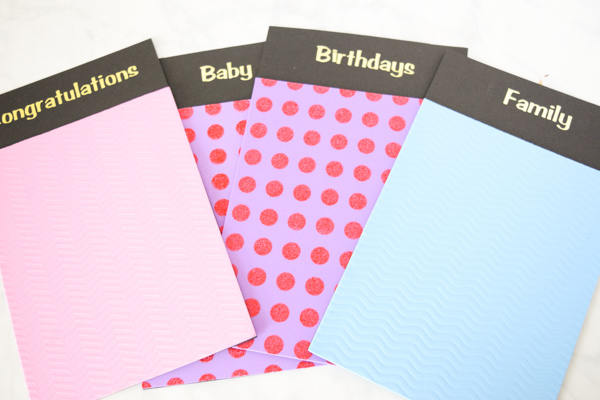 The categories I chose to create were Baby, Birthdays, Girl Birthdays, Boy Birthdays, Congratulations, Family, Get Well, Graduation, Sympathy, Thank You, and Wedding. I also decided I wanted to add black cardstock to the back of the foam sheets for two reasons. First, the foam sheets I had weren’t tall enough on their own. And second, the cardstock added extra stability. 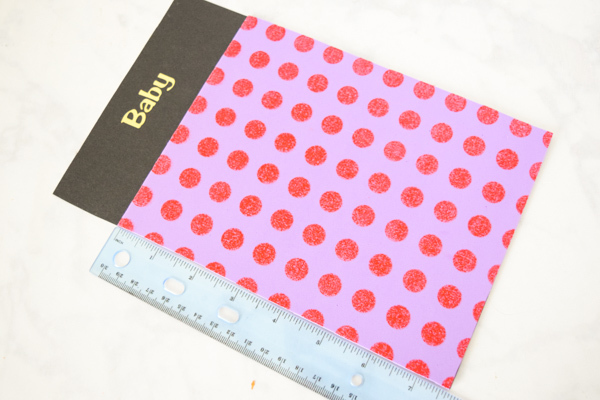 The width for both the cardstock and foam sheets is 6.5 inches. I measured the cardstock at 9.5 inches tall and the foam sheets at 7.5 or so. 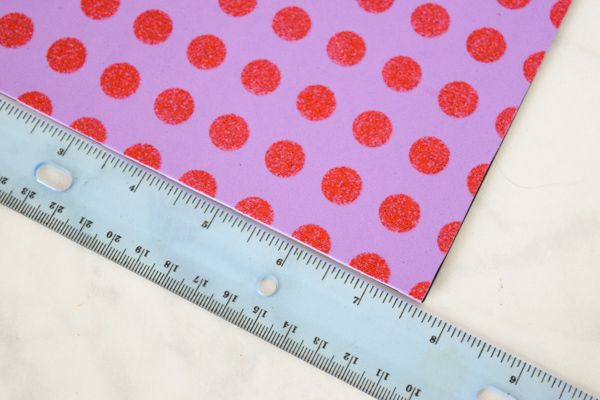 The purple with pink polka dot sheeets actually came in a larger size and needed to be cut down too. Once they were cut, I used double sided tape to adhere the two together. Next, it was Cricut time! 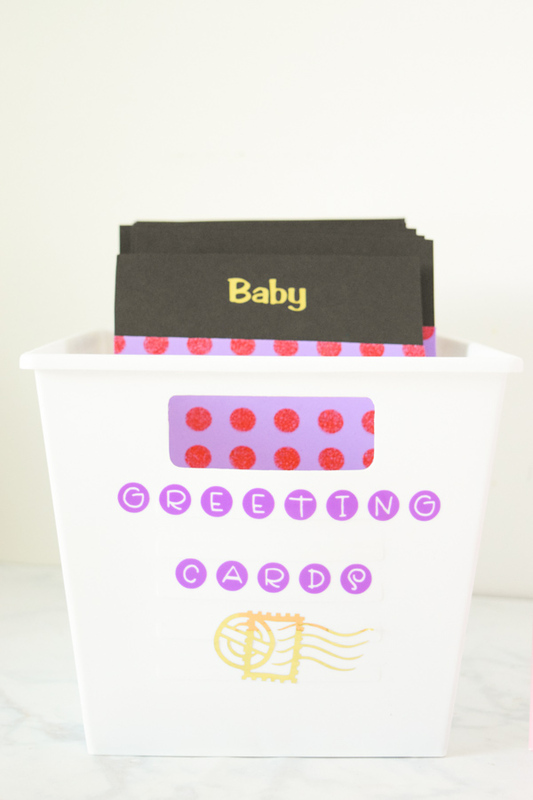 I wanted to create a fun label for the greeting card file box and then for the category labels. I chose to use gold foil adhesive vinyl for the category labels. Open up Cricut Design Space. Click on “add text”. Type out your first category. On the right side of the screen, you can click on “edit” and change the size and the font. I chose a font called Arab Brushstroke Std Regular and sized it down to 56 pt. 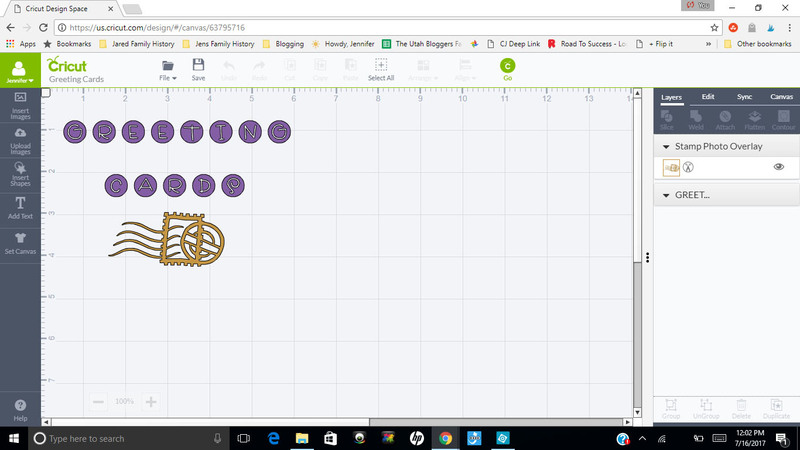 Once all of my categories were typed out, I sent it the machine and cut them out on Cricut’s Gold Adhesive Foil. 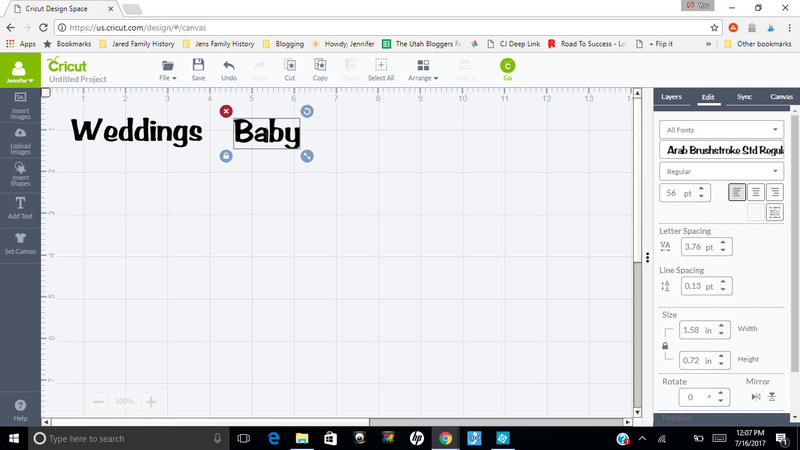 If you have markers for the Cricut, you could also draw out the words on the cardstock. Just be sure the cardstock isn’t adhered to foam when you do it! After weeding out each word, adhere them to the transfer tape. Place them on the word on the cardstock and remove the transfer tape once the vinyl is adhered to the cardstock. I had no troubles with the transfer tape sticking to the cardstock. It worked perfectly! For the greeting card box, I decided to call it “Greeting Cards”. I know, creative, right? I wanted a fun font and chose to use Cricut’s “All Mixed Up Circle” Font. The size is 60 pt. You can find the design here. On a new layer, add a fun postage stamp image from the Cricut library. Size it down so it looks good with the font. The Cricut machine cut each layer separately so it made things easy! I chose to cut the “Greeting Card” words on regular purple vinyl and the image on the Gold Adhesive Foil. Next, weed out the words and the image and get them on the transfer tape. Place them on the box and carefully peel away the transfer tape. Voila! That’s all there is to it. The entire project took me under an hour to make. I love it so much, I’m going to make one as a wedding gift! Newlyweds need things like this too! Now it’s easy for us to grab a card on our way to a party. 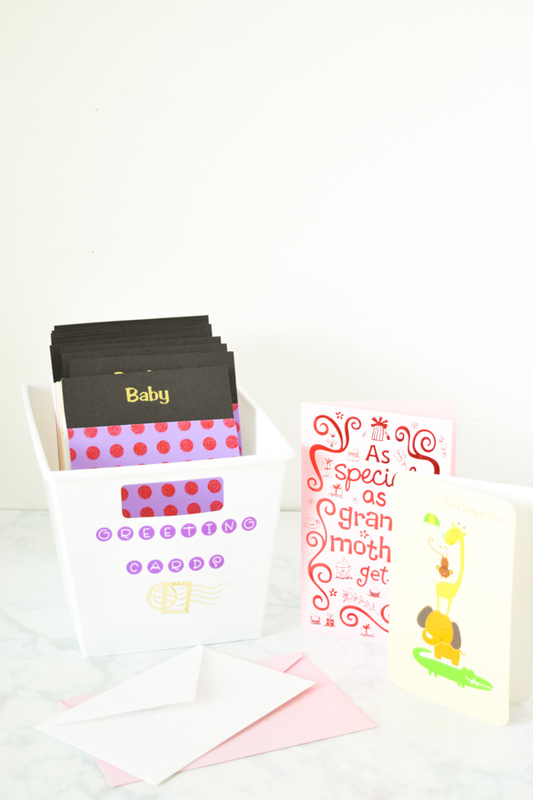 I always know right where they are and fill it up a little at a time with new cards from the dollar store. If you’re ready to grab a machine for yourself, or you need some vinyl, you can find all the supplies you need right here.